It’s time for some basic maintenance on a 2000 5.4L Ford F150. We will change the oil, oil filter, air filter and PCV valve. Tools: 16mm socket and ratchet, Strap type oil filter wrench, oil catch pan, filling funnel and two car ramps. Materials: 6 quarts 5W-30, oil filter (Fram PH2), gloves, rags, bottle for the used oil. Interval: Every 6,000 miles under normal driving conditions. Change more frequently with dusty or stop and go city driving. 1) Warm the engine up to operating temperature. 3) Set the parking brake and block a back tire. 5) Loosen the 16mm drain plug with a socket and ratchet. Have a rag ready to wipe the plug. 6) With a glove on your hand, turn off and remove the drain plug. 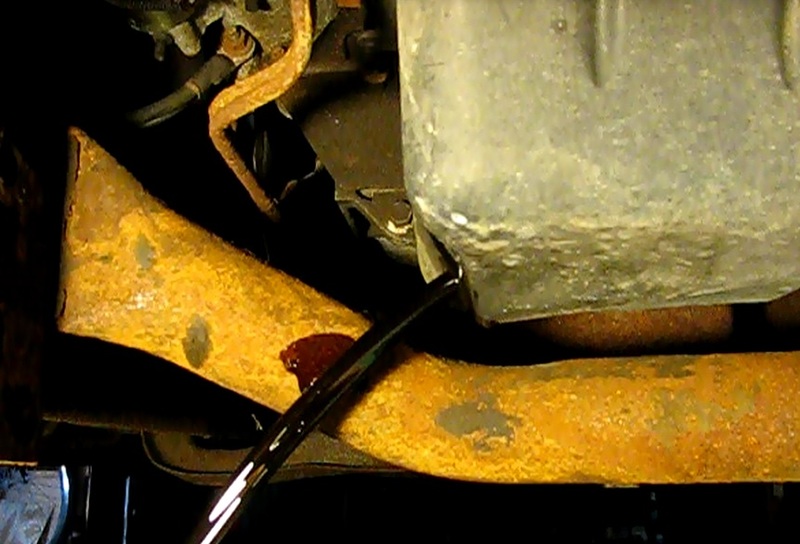 7) Let the oil drain until it has slowed to a few slow drips. 8) Re-install the drain plug and snug it up. Not too tight, though. 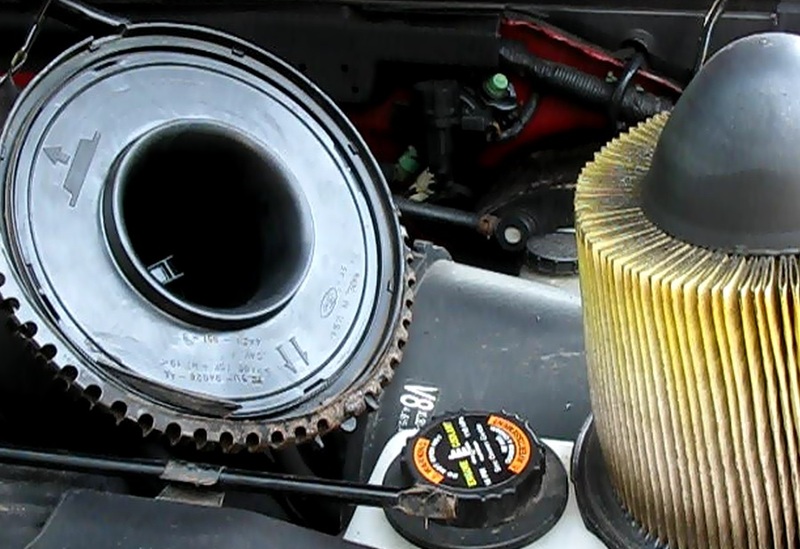 9) Re-position the catch pan under the oil filter. It’s right next to oil pan. 10) Using the filter wrench, turn the filter off in a counter-clockwise direction. 11) Drain as much of the used oil out of the filter as possible. I like to set it upside down on a screen placed over the catch pan. 12) Put a bit of clean oil on the rubber ring of the new filter. 13) Turn the filter on by hand. When it makes contact with the engine turn ¾ turn more. 14) Remove the oil filler cap and add 6 quarts of oil. 15) Run the engine a bit and then after 10 minutes check the level with the dipstick. Add oil as needed. Interval: Once a year under normal driving conditions. 1) Unsnap the two metals catches on the air filter cover (located to the right of the engine when facing the hood). 2) Pull the upper cover toward you until it disengages from the lower part of the filter housing. 3) Remove the filter and discard. 4) Seat the new filter in the lower housing. Make sure to follow the direction arrows. 5) Snap the cover back in place. 1) The positive crankcase ventilation valve is located on the passenger side valve cover. 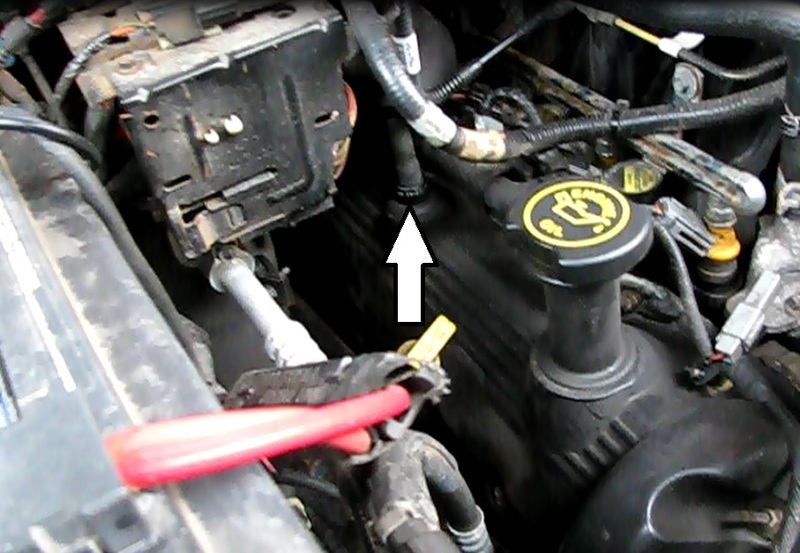 A rubber hose is connected to it. Simply pull it out of the cover with the rubber hose attached. 2) Take it off the hose with a turning motion. 3) Shake it. If it rattles it is likely still good. This is a five dollar part. Change it anyway. It allows gases that build up in the crankcase to be purged when they reach higher levels. 4) Install a new valve into the end of the hose. 5) Press back into the valve cover.